On Monday, I shared about my favorite day of the year. Here are some photos on what we did after we visited the butterflies! "What if I put my fingers over his mouth, MeMe?" before letting her push the button. Gotta love big brothers. She really, really wanted to put her hand in that water! Yes, that's a Komodo Dragon on a leash! I've been craving S'mores lately. 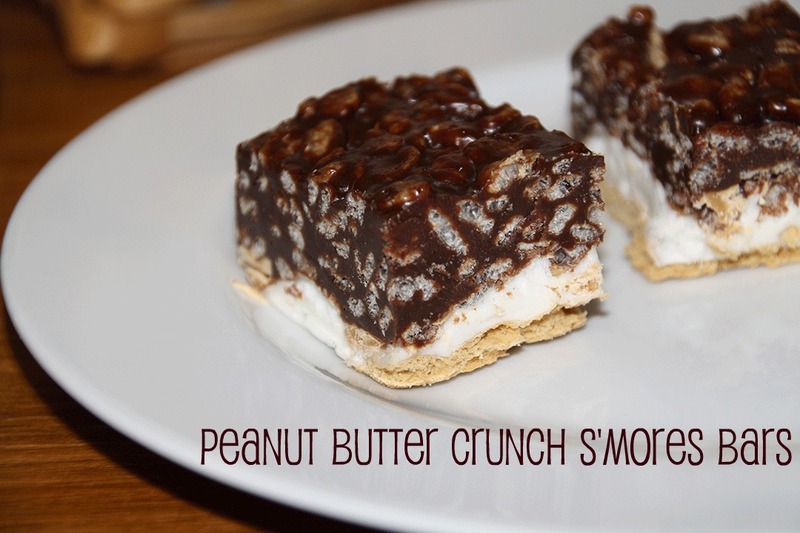 You may have realized that already as this is my second "s'mores" related post in a week! Remember the S'mores Popcorn? So when I found this recipe on my "Recipes I Need to Try" board on Pinterest, I knew I had to test it out. If you want a simple to make yet delicious to eat treat, you must try these. Coat 13x9x2-inch baking dish with cooking spray. Cover bottom of pan with single-layer of graham crackers (you may need to break them to cover completely). Spread marshmallows evenly on top of crackers. 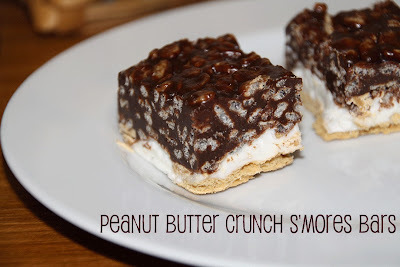 Roughly chop peanut butter chips and sprinkle them over the marshmallows. Bake for 8 minutes or until marshmallows are "puffy." Cool completely. In microwave-safe bowl (or on the stove), mix chocolate chips, corn syrup and butter. Microwave on high for about a minute and a half or until chocolate is melted. Stir every 30 seconds. Once chocolate is melted, stir in peanut butter until smooth. Add Rice Krispies and stir until coated. Spread over the marshmallows. Cover and refrigerate for an hour or until firm. Store in an airtight container in refrigerator. So good that once they were set, I immediately cut them and divided the bars into 4 containers and delivered them to family so I wouldn't eat the entire batch! Christmas. Your Birthday. Black Friday. One of these may be your favorite day of the year. My favorite day of the year is when I go see the butterflies at White River Gardens in downtown Indianapolis. This year my sister treated me to a day with the butterflies AND my precious niece and nephew. There's just something about these creatures that makes me smile. If you live near Indianapolis, I definitely suggest you check this exhibit out. I think the gardens and zoo are a combined ticket so plan for an entire day of fun. I think the butterflies are there until early September! These wildflowers in my parent's yard made me smile last week when I saw them so I thought I'd share. I love seeing the Throwback Thursday photos pop up on Facebook and Instagram so I thought I would share a couple of my favorite Throwback photos. This is my grandpa and his niece. I have no idea what year this was taken but since I know his niece is now a great-grandma, it has to be at least 70 years old! It's hard to imagine that my grandpa farmed with horses. This photo was taken in 1957. As you can see, he moved to tractors by then. I wish I had taken more photos of him on the farm in his later years. It would have been cool to see him in a big green tractor with a cab and a grandkid on his lap. He drove a tractor until he was in his 80s. He was something else! I'm so excited about a trip later this year to Vegas with a couple of girlfriends. I got a great deal on my flight. However, I know we want to go see a show, visit Hoover Dam, eat at good restaurants and gamble just a little. This means I need to start saving my pennies. What better way to save than by using this cute chalkboard bank I picked up during graduation season in May. I also grabbed a box of chalk to try and get my "crafty" side to emerge. I really should have picked up an eraser too but after a couple of attempts, I think it turned out OK. Here's to hoping I come home with some pennies to put back into this bank after my trip to Vegas! S'mores are probably one of my all-time favorite summer treats. So when I was looking for some sweet snack ideas to take to my nephew's birthday party on the 4th of July, I couldn't resist trying to create my own version of S'mores popcorn. If you search "s'mores popcorn" on Pinterest, you'll find quite a few versions of this sweet treat. I didn't have all of the ingredients some of them called for (or didn't want to do all the steps of others), so I made it up as I went. Popped a bag of plain microwave popcorn (the non-butter kind) and let it cool in a large bowl. Crushed 4-6 graham cracker squares into fine pieces (could have used more or crushed them less fine for "chunky pieces"). Melted 4 squares of Almond Bark in the microwave until smooth. Poured the melted Almond Bark over the popcorn and mixed. I stirred it a couple of times and then dumped it into a 9x13 brownie pan so I could get it evenly coated. Added a cup and a half of mini marshmallows and a cup of chocolate chips to the popcorn. Stirred it together and spread it out on wax paper to cool. I actually made two bags of popcorn so once I tasted the first batch, I made another one! I put it in these cute patriotic paper dishes and took it to my sister's. It was a huge hit. I do suggest that you store leftovers in an air-tight container because I left the lid slightly ajar overnight and the popcorn got a bit stale. It was still good the second day!